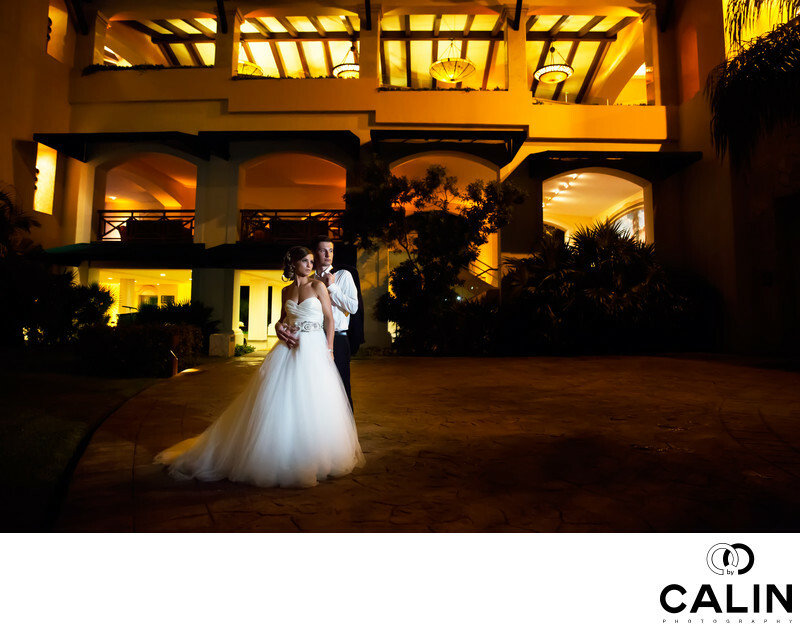 This is one of my favourite shots I took during the first wedding I photographed at Barcelo Maya Palace in Mexico. During the reception I went out to check the surroundings and found a good spot for perfect wedding photo. I asked a bridesmaid to pose as a subject and set up the light. After the wedding reception ended, the bride and groom were exhausted and didn't want to take more pictures. I literally begged for them to give me 10 seconds. I asked the groom to take his jacket off and put it on his shoulder and to stand behind his wife. They're both looking towards the light was placed to of the right of the camera. Behind them you can see the beautiful Barcelo Maya a lobby with three massive chandeliers. Unfortunately, the resort transformed the spot into an underground parking and and no you cannot take this picture anymore. To capture this image I used a 24 to 70 F2.8 lens mounted on a Canon 5D Mark III camera. The bride and groom are positioned on the left side of the frame with their heads placed on the baroque diagonal, leaving plenty of negative space on the right as if they're looking towards the future. In post processing only remove the few garbage bins, colour corrected photograph and perform some dodging and burning.